It’s time once again for our first annual Greater Boston FinTech year in funding review. 2014 saw roughly $194 million invested in private financial technology companies, a substantial jump from roughly $86 million in 2013. But, for perspective, keep in mind that several individual FinTech firms in other regions, including Stripe and Square, raised rounds of as much as $150 million. The second largest investment – $40 million – went to Credorax, another firm in the payments space. Funding came from Columbus Nova Technology Partners and Blumberg Capital. More than 30 investors and firms participated in investment rounds for local FinTech startups. Spark was the most active investor in the Boston area, participating in three financing events – for peerTransfer, Quantopian, and Goji (formerly Consumer United). Khosla and Great Oaks each participated in two, with Khosla leading Plastiq’s Series B. Immediately following the round Plastiq decamped for San Francisco. Here’s a rundown of the funding events I’m aware of. 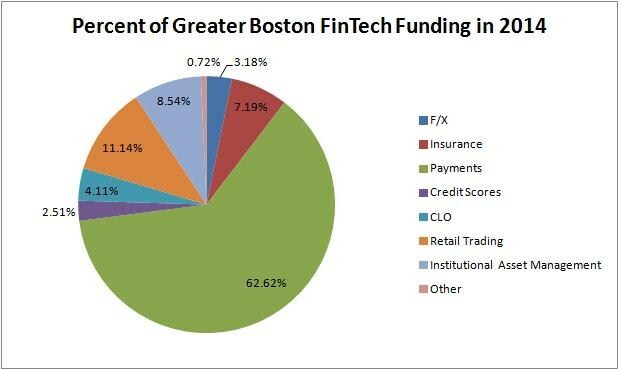 I now count more than 80 FinTech startups in greater Boston. Several are putting the finishing touches on seed or A rounds they’ll announce in early 2015. Others are two or more years from their most recent round and will be looking for capital, or an exit, this year. As in any ecosystem of this size, we’ll see some enter, some grow, some falter, and some close down over the course of the next year. Disclaimer: The sources of this data include, in order of authority: Edgar, reputable publications, Crunchbase, disreputable publications, rumor, speculation, innuendo, and Google+. Please report all errors, whether of omission and commission, to the author. This entry was posted in FinTech and tagged Boston, startups by jim. Bookmark the permalink. RT redphase: Here’s my list of greater Boston #FinTech firms that raised capital in 2014: http://t.co/tQTCYu3ObV Did did I miss any?